One More Kiss produced a solid first up effort last Sunday to take out the Class 1 Handicap over 1200m, at the Sunshine Coast. Jumping form barrier five in the field of eleven, the three year old settled midfield as the leader ran along at a genuine tempo. She was bought to the outside at the top of the straight by jockey Paul Hammersley and she let down strongly to score by a nose. It was win number two for One More Kiss, who was having just her fifth race start. 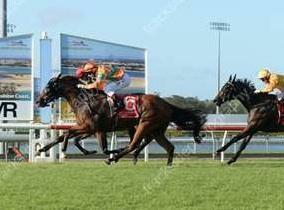 Trainer Steven O'Dea will now look towards some nice upcoming three year old fillies races for her next month.